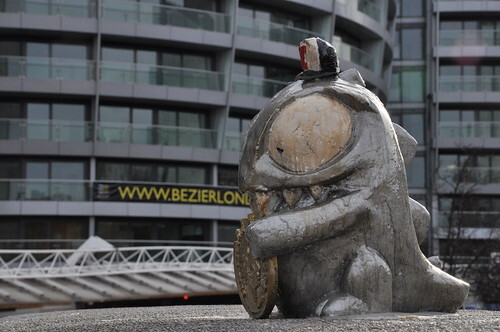 Vandal Extraordinaire RONZO has celebrated the end of the recession in the UK, by installing these awesome limited edition credit crunch monster sculptures in London's financial district. We spotted one yesterday afternoon in Aldgate and another on Bishopsgate, although the illegal sculpture in the Bishopgate location has now been removed by the council or else stolen by a streetart collector!! The guys over at Graffoto have a bunch of photos and the full story on these Crunchy Monsters.Read it here.